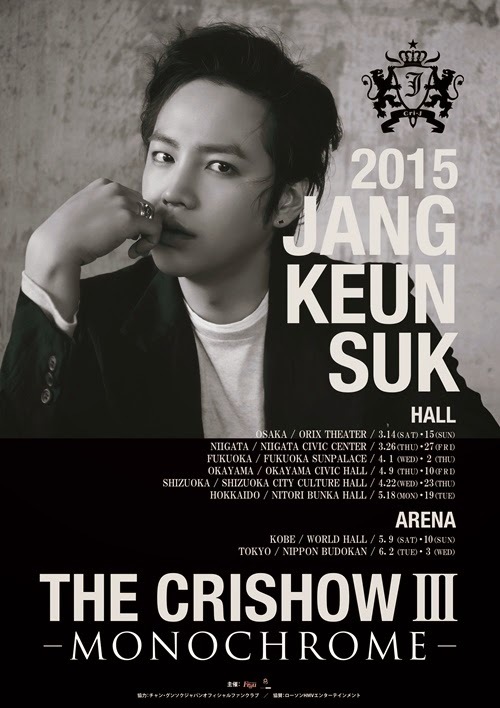 Jang Keun Suk will be launching 2015 Jang Keun Suk The Cri Show 3 around cities in Japan. The tour, which will begin with the Osaka concert on March 14, has completely sold out tickets for the 12 hall concerts in six cities (Osaka, Niigata, Fukuoka, Okayama, Shizuoka, Hokkaido) and four arena concerts in two cities (Kobe, Tokyo), for a total of 16 concerts. The ‘Cri Show 3’ taking place following the 2011 and 2012 tour, will unveil the artist’s third Japanese original full length album Monochrome for the first time. Unlike ‘Cri Show 1,2’, which focused on storytelling through elements of a musical, Jang Keun Suk will be interacting with the fans with deep and high quality performances by focusing on the music itself. Meanwhile, Jang Keun Suk’s 2015 Jang Keun Suk The Cri Show 3 will begin on March 14 and 15 in Osaka.